Zac Lowther won his Bowie debut by giving up 2 hits over 5.0 scoreless innings with 2 walks and 6 strikeouts; he threw 77 pitches, 50 (strikes). 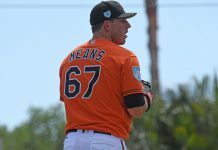 He is the Orioles Hangout MiLB Player of the Day. DJ Stewart went 1 for 2 with 1 double, 2 walks and 1 stolen base. Keegan Akin gave up 1 earned run on 3 hits with 3 walks and 3 strikeouts over 3.0 innings. Yusniel Diaz went 1 for 2 with 1 run scored, 1 homerun, 2 RBI and 2 walks. Ryan McKenna went 2 for 5 with 1 run scored, 1 double, 2 strikeouts and was caught stealing. Jomar Reyes went 5 for 5 with 1 run scored. Trevor Craport went 2 for 5 with 1 run scored and 1 strikeout. David Lebron pitched 3.0 scoreless innings with no hits, 2 walks and 7 strikeouts.